A very familiar face in our lawns and gardens is the dandelion, whose puffy mature flowers and persistent tap roots spell out a seemingly-endless reign over any livable area. And while it is true that unwanted dandelions are the poster child for weeds, surprisingly, this hardy plant does have some good to it as well. First off, the dandelion is very edible. Its leaves, stems, yellow flowers, and roots are perfectly safe for consumption. The bitter taste of the flowers, stems, and leaves can be lessened by picking young plants, and further reduced by blanching them before serving. The roots can be cleaned and ground into dandelion coffee, although this is likely a recipe only for the bravest of cooks. In a garden, the dandelion sounds out of place—but don’t be so quick to weed it if you are working with clay soil or worry that the soil is lacking in microbes or little critters, which quietly improve your cultivated plants. 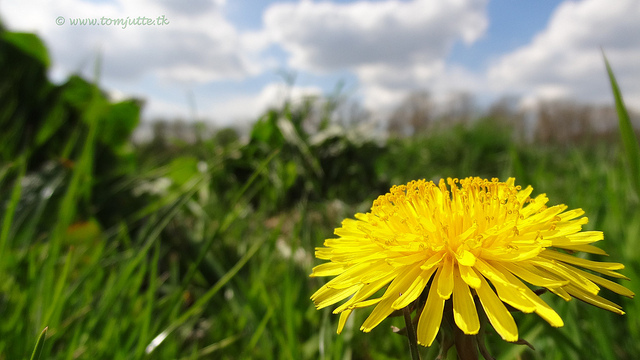 The deep roots of dandelions and other weeds can help bring up water and nutrients from the lower levels of the soil, and the entire plant can feed microbes and small soil-dwellers. Weeds can also indicate soil conditions—for instance, dandelions grow the most in acidic soils, which also are good for blueberries, potatoes, cucumbers, and rhubarb, to name a few. In short, the dandelion may not stick around in your garden for long, but do consider ending their lives in a salad bowl, picking the plants before the yellow flower closes again and reveals the seeds. Dandelion greens are enjoyed by rabbits, and pigs, and goats. And enjoy your day off of weeding!